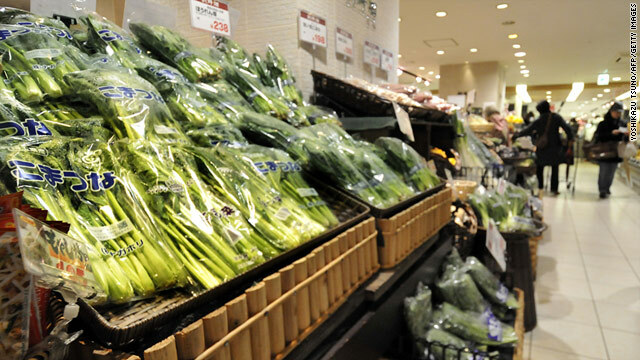 FDA: Some foods from four Japanese prefectures can't enter U.S.
Fresh vegetables are among the foods produced near a Japanese power plant that won't be allowed in the United States. (CNN) -- In the wake of Japan's nuclear disaster, all milk, milk products, fresh vegetables and fruit from one of four prefectures closest to the quake-stricken Fukushima Daiichi nuclear power plant will be prevented from entering the United States, a spokesperson for the U.S. Food and Drug Administration said Tuesday. All other food products produced or manufactured in one of those prefectures -- Fukushima, Ibaraki, Tochigi and Gunma -- will be diverted for testing, the spokesperson said. Food products from other parts of Japan will be tested as resources allow, but the FDA's main focus is food from these four areas, the spokesperson said. The Fukushima Daiichi nuclear power plant suffered damage from the earthquake and tsunami that hit Japan on March 11. Efforts to bring the plant's cooling systems back online to stabilize the situation continue. Some of these food products have already been officially taken off the domestic and export markets: Japanese Prime Minister Naoto Kan had previously ordered the governors of these four prefectures to halt the distribution of spinach and the local vegetable kakina and told the governor of Fukushima to cease all raw milk distribution, the FDA said. The FDA will continue to flag all entries from Japan in order to determine whether they originated from the affected area, the spokesperson said. Levels of radioactive iodine in milk were found in four locations in Fukushima that ranged from about 20% over the acceptable limit to more than 17 times that limit, Japanese officials said Sunday. Testing at one location also found levels of cesium about 5% over the acceptable limit, the health ministry reported Sunday. Keep in mind that the United States only imports 4% of food from Japan in general. And consuming the affected milk and spinach every day for a year would translate into taking in the same amount of radiation as a single CT scan, Japan's Chief Cabinet Secretary Yukio Edano has said.